A reasonable mind would not be faulted for saying Party #1 is dangerously criminal while Party #2 may not be exercising good judgment, but they are not criminal. A reasonable mind would be wrong, VERY wrong. Party #1 are the Hutaree, a militia that planned to kill law enforcement officers and hate the US government. In exonerating the Hutaree, District Judge Victoria Roberts said that David Stone’s ‘statements and exercises do not evince a concrete agreement to forcibly resist the authority of the United States government ‘. Justice was not blinded by Law; America stood tall even as some very disgusting people went back to training against their country…with weapons. For Party #2 a young Muslim called Tarek Mehanna, America did a turnabout and followed the footsteps of all oppressive regimes throughout history; they convicted a man for his thoughts. Even though the charges of conspiring to kill Americans overseas were not proven, it did not matter. US District Court Judge George A. O’Toole Jr. said he found Mehanna’s speech to the court Thursday to be evidence of his “strong and magnetic’’ personality, but said he also saw a darker “Jekyll and Hyde’’ side to Mehanna. America is defended against those unimaginable “terrorists” (read, “Muslims”), screw abstract issues like “Justice”, we are trying to keep America safe! We must accept some sacrifices to help keep the country secure…let’s toss some “Muzlems” as the sacrifice, they are not really us anyway! 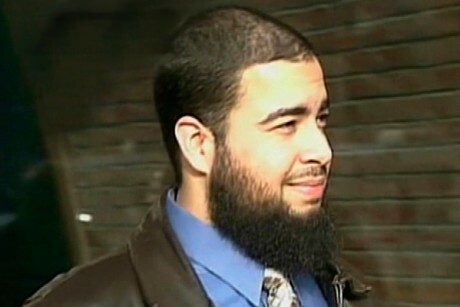 Perhaps as his last hurrah, Tarek gave a sentencing statement in court, that the judge interpreted as “defiance”, but still gave him a “light” sentence of 17.5 years expecting Tarek to go straight into a Supermax Prison cell where Most of us “Muzlems” are kept because we are considered to be absolutely the most dangerous people on Earth. So dangerous that our Administration spend tens of millions of dollars annually, to train our law-enforcement agencies and our military, that Islam and Muslims are the greatest threat to the US and to the West. Other private religious (Right-wing Christian and Jewish) organizations spend many times more than the Government, in brainwashing innocent and sincere Americans on the same issue, bringing in false, self-styled “experts” on Islam and “Terrorism”. Muslims have nothing to combat such a mass of wealth and organization; those who believe “Truth will prevail” are in denial of the dire consequences of falsehoods that can launch genocidal actions. The few who can stand as witnesses to the horrors of a successful hate-campaign (Jews, Japanese, Chinese, Native Americans, Blacks and more) cannot seem to get organized to join the feeble efforts of Muslims, to convince our government to change their ways. Muslims are in complete disarray, probably believing the more prayers in the Mosque will bring God into play and HE will save us all. No, He won’t. He wants to see how committed we Muslims are, to make this a better world for ourselves, for our children and for the rest of the world.